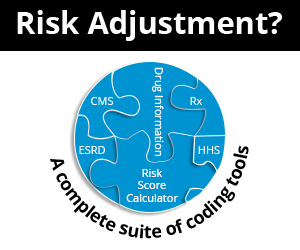 The following table is taken from the Contract-Level Risk Adjustment Data Validation Medical Record Reviewer Guidance dated 2017-09-27 (see References). It is a listing of acceptable provider interpretation of diagnostic testing. Reviewers should only submit diagnoses documented in the physician interpretation, not the technical report. Do not submit records of diagnostic radiologist only. If an exact diagnosis is not reported, and the record is identified as outpatient, apply outpatient coding guidelines to code the condition to the level of certainty documented. Often the reason for the test is listed as symptom or abnormal findings on another test. If the reason for the test is to rule out a diagnosis, do not report the diagnosis if the exam is normal or does not indicate the rule out diagnosis. The reviewer must use judgment based on the type of procedure/test or other documentation available when determining if a chief complaint or reason for a test is a current diagnosis or was a condition to be ruled out. MRA, reason for test: non-healing ulcer. MRA studies rule out vascular or heart disease, not ulcers. The ulcer would be reported as a current condition along with any abnormal findings of the study. Interpreted diagnostic testing within inpatient records: See guidance for Other Physician Documentation. Generally, interpretations from acceptable provider specialties are acceptable as long as there is no contradiction with the attending physician diagnosis. Diagnoses documented in EKGs, MRA, Doppler studies, and other testing must be addressed by the attending physician or consulting provider to submit for condition validation. Researched on a case-by-case basis to determine if study is performed by a Diagnostic Radiologist or a valid physician specialist, such as Vascular Surgeon or Cardiologist. Stand-alone/outpatient EKG interpretations are considered for reporting on a case-by-case basis. The cardiologist signature must be present and the results supported in the clinical notes. Findings are often “suggestive of” and not confirmed diagnoses. This is especially true for “Old MI (myocardial Infarction)” findings since false positive findings are not uncommon.